Die Walkure moves from the industriousness of Rheingold to realms of domestic drama, between siblings/lovers, husbands and wives and, devastatingly, between father and half errant daughter. Already we feel ripples from Alberich�s curse spreading and gathering force towards the overwhelming finale of Götterdämmerung. This wonderful Walküre is also �domestic� in a different sense. 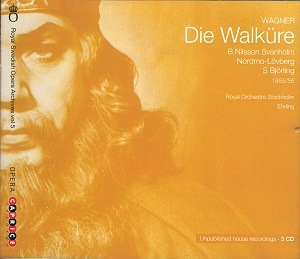 The booklet emphasises that the recordings are not broadcasts or illegal recordings from the audience but in-house recordings from the Royal Opera House Stockholm. Valter Valentin, a member of the Royal Opera, made the recordings from a first tier box with the possible help of his son, a Swedish Radio recording technician. These treasures were held in the national archives until Caprice/Royal Swedish Opera released them in a series, of which this Walküre is the fifth volume, for opera lovers world-wide to enjoy. There are no weak links in the cast. Indeed this is overall the kind of heroic Wagner singing which I largely missed when reviewing the recent Naxos Rheingold . Set Svanholm is a known quantity and here confirms himself as one of the finest Siegmunds. His voice is tinged with a sunny timbre although he can harden heroically when required. Svanholm�s opening lines in Act 2 scene 5 are liquid and floating with tenderness and love for Sieglinde. Within moments the voice leaps forward with added metal, ringing out for "Nortung zahlihm den Zoll". Svanholm�s whole performance is an intelligent dramatic traversal of Siegmund�s story. He is untiring and has all the vocal goods to deliver one of the finest performances I have heard. The other familiar Wagnerian is of course Birgit Nilsson, here towards the beginning of one of the greatest opera careers on record. Her voice is highly focused, beaming out with steel-clad power. You can almost see some notes blast from the stage into the auditorium. Here Nilsson�s shining metal certainly becomes the imperious goddess, at first detached from the human world. Then the Act II Annunciation is injected with feeling at the start so her final rally to Siegmund has comparative stature. Her Act 3 pleas to Wotan are also impressively acted. For all that I am niggled by a coldness in Nilsson�s shining tone. The metal does not warm with all the colours I love in my favourite Brünnhildes including Martha Mödl (live 1953 with Furtwängler) and Gertrude Grob-Prandl (live, Geneva 1951). On to the discoveries. Anna-Greta Söderholm is a passionate Sieglinde, with more colours than Nilsson, especially through a deeper chest tone. There is real warmth and feeling here and the text is clearly projected. Söderholm also opens out thrillingly when needed and, yes, does cry out for that Big Act 1 �Excalibur Moment�. Both she and Kerstin Meyer�s Fricka are steady but with an attractive vocal vibrancy. In both cases I felt a connection with the characters portrayed. Meyer evokes a tangible melancholy behind her initial remonstrations with Wotan: a marital argument borne also through sadness and loneliness. Sven Nilsson, a distant relative of Birgit, has the requisite dark depth and width of voice, contrasting well with and threatening to overwhelm the incestuous twins. Sigurd Björling�s Wotan can also be heard in an Act 3 Walküre captured live by EMI at the 1951 Bayreuth Festival. Björling is a steady, oaken Wotan, well acted to portray both father and commander. Björling can colour his voice from the impressive ringing threats against Brünnhilde ending Act 2 to sorrow in the Farewell. There is occasional strain in his top notes, but nothing bothersome. Björling and all these Stockholm Royal Opera-based singers should be better known, fully justifying this special archive release. I would like to hear more archive recordings conducted by Sixten Ehrling. Many must exist as Ehrling had a long career and died only recently, in 2005. The booklet notes Ehrling�s "rather unyielding tempi and few portamenti" and that he demanded high levels of technical accuracy from his orchestra. It�s true that the orchestra does not always �sing�, noticeably in the second half of Act 1, but I was never aware of barlines and he clearly knows how to develop long phrases. There is also great passion, noticeably at the close of Act 2 and the deeply poetic Farewell with its subtly shifting tempi. The critic Michael Tanner says the orchestral crescendo in the Farewell after Wotan sings "der freier als ich, der Gott!" is an "acid test of conducting if there ever was one". Here Wagner�s great orchestral arch is both grand and gentle, graduated through soaring violin phrasing and anchored through forceful bass and exciting timps, causing some distortion in the recording. The rubato toward the peak is not as physically exciting as Furtwängler (live 1937) but Ehrling�s subsequent descent holds a steady pulse, with floated line and the required repose. The recording quality is variable. The opening Prelude starts clearly enough with richness in the bass. This basic fullness and presence usually remains throughout the opera. However the recording almost collapses with distortion in some triple fortes, such as the weight of timps in the Prelude�s culminating crack of thunder. Sonic wobbles in the Act 2 Prelude seemingly threaten to derail the CD from my player altogether. Parts of Act 3 are patched from a broadcast. Does this explain the massive dropout right after Brünnhilde�s last lines? Woodwind are too far forward but this brings revelations, such as the marked lightening of orchestral colour before the incestuous twins praise Spring and their newfound love in Act 1. In-your-face piccolos are annoying in the Magic Fire music and tubas are also more present than I enjoy. Yet simple miking brings revelations and not all climaxes are badly compromised. Ehrling certainly does not conduct a quasi-Bellini approach to Wagner and the tape machine usually copes to capture this. Try Act 2 scene 5. I�ve never heard the timps slam with such decisive power as Sieglinde fears Hunding�s approach. The escalating thunderous black cacophony from brass and timps at the close is devastatingly full-throated. Neither pretty nor polite, but wonderfully dramatic. Valentin�s tape machine recorded a much stronger orchestral profile, as I personally prefer, than Bayreuth broadcasts from the same era. However I wish Wotan was more forward to bring greater authority in his Farewell. The upstage warring Hunding and Siegmund almost disappear at the end of Act 2, as you might guess. Creaks, stage noises and audience bronchial afflictions are occasional and never hinder enjoyment. Unlike Testament this Walküre fits onto 3 mid-priced CDs. Caprice includes a 20 page English-only booklet containing information about the recordings and history of the music-drama at Royal Swedish Opera. There is no libretto or synopsis but interesting biographies of the singers and photographs, including a photograph of Nilsson�s youthful Brünnhilde pleading at Wotan�s feet which I wish I could reproduce with this review. Both gods wear capes, Viking-style breast plates and Wotan even has a helmet with impressive wings. Many modern directors would consider such costuming a terrible anachronism but I found it deeply moving.